I started this blog six months ago. We had just launched a corporate blog and the positive feedback it received convinced me that i also should publish my – this word is a bloggers’ favourite – musings online. June was good, experimenting, laying the ground-rules, posts on people and places closest to my heart – Sangham, REC, Vonnegut. July was better, lot of passion, lot of posts, and the response from my core audience was excellent. That scared me. I froze. I couldn’t write. I started posting stuff from my ‘Stuff’ folder and stuff i found on the Net – Meera Nandakumar, ‘I am a Malayali’, Chak De Mallus… My friends had given up on the blog, but the high that the blog-stats gave me made it easier to ignore the fact. Not any more. I am going back to my original credo. Then when he began to load the sleigh one of the boards cracked and the toy bag fell to the ground and scattered the toys. So, frustrated, Santa went into the house for a cup of coffee and a shot of whiskey. When he went to the cupboard, he discovered that the elves had hid the liquor and there was nothing to drink. In his frustration, he accidentally dropped the coffee pot and it broke into hundreds of little pieces all over the kitchen floor. He went to get the broom and found that mice had eaten the straw it was made from. Just then the doorbell rang and Santa cussed on his way to the door. Deepa sent me this ages ago. Sometimes, when i get this urge to blog, but my brain doesn’t share my enthusiasm, i hit people with my old photo album. Tonight is one of those nights. On display are my Class III and Class IV pics. I had posted my Class I pic earlier. In fact, i had wanted to post all my St. Teresa’s pics together, but i could not locate the Class II pic, so i posted the Class I pic, went searching for the Class II pic, but…now you know. 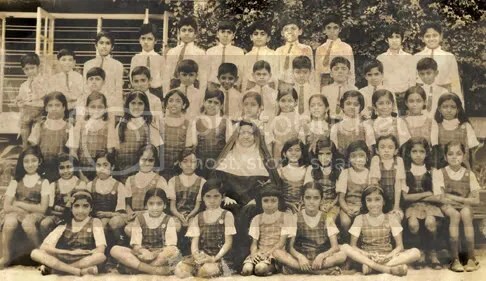 3rd Row: Benny, Sreekumar, Reny? ?, Ram? ?, Aju, Leni, Milton, Me, ? ?, Jayashree (Daughter of Wisdom Maash), ??, ? ?, ?? Sitting: ?? (Milton’s sis? ), ??, ? ?, Nisha, Sheeba? ?, Teacher? ?, Sweety, ??, ? ?, ?? 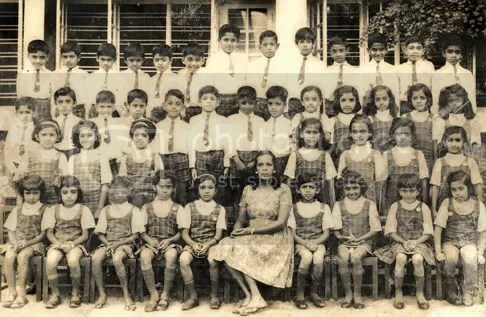 Plus Jojo Jose (Rajagiri 1981, Row 5, 7th from left), Shakeel (REC 1987, Row 4, 2nd from right) and Jacob/Varghese (To Shakeel’s left, Benny’s cus).